Please subscribe to stay informed about new releases. All editions are available from Stanley Yates' author page at Amazon.com and the various international versions of Amazon. Period arrangements for two guitars of major piano and orchestral works by Beethoven, Haydn, Mozart and Rossini. Includes background text, full scores, and individual parts presented in a faithful modern typeset reproduction of the originals with editorial corrections. A practical modern performance edition of the complete surviving solo guitar sonatas of the early nineteenth-century Viennese guitarist-composer Wenzeslaus Thomas Matiegka. Matiegka’s guitar sonatas embrace the sonata style of Haydn on the one hand, Beethoven on the other, and include full-blown concert works along with works for serious recreational guitarists. Includes comprehensive notes relating to Matiegka, his compositional style, and his technical approach to the instrument. "Any publication with Stanley Yates' name on it is going to be worth whatever time and effort it takes to get into it, and this tome is no exception...all of the works are thoroughly interesting and involving, and Yates' detailed and fascinating 24 pages of historical research and analysis are most enlightening." 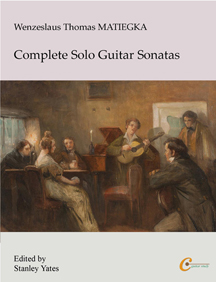 A set of nine high-quality four-movement sonatas written by one of the major composers of his time arranged in idiomatic and stylistic settings for the modern guitar. Includes detailed background and performance information. "Wonderfully adapted to the guitar, sounding perfectly natural...any of them would be a superb concert choice...the preface is detailed and fascinating, as one would expect from Yates"
"a welcome contribution to the rich and multifaceted flora of baroque music transcribed for guitar"
"Fabulous addition to guitar repertoire. Very idiomatic and high quality arrangements. The forward is excellent as well. A must buy." "Great addition to the intermediate guitar repertoire. As I play these pieces, I imagine that I've stumbled into an undiscovered vault of Vivaldi's compositions for guitar...these pieces are stunningly beautiful, as would be expected from this great composer." "This is a superb edition of some very attractive music. The transcriptions are completely fluent and idiomatic, very stylish, and all lie comfortably under the fingers. The detailed Introduction provides lots of valuable background information on the music (particularly on issues of articulation and ornamentation). Mr Yates' wonderful edition of the Bach cello suites was a revelation to me when I first came across it ten years ago, and I still play through it regularly and with great enjoyment. This edition of the Vivaldi sonatas is an ideal companion volume to it." 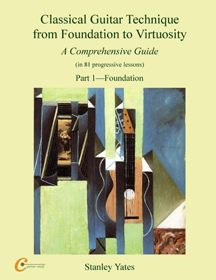 Intended for intermediate and advanced players alike, Classical Guitar Technique from Foundation to Virtuosity, offers a step by step guide to optimizing the basic foundation of playing technique and to developing it to the highest levels of advanced playing in a day to day sequence of short, clearly explained practice sessions. In 81 progressive lessons, CGT provides a comprehensive and precisely-structured approach to the full development of playing technique in a time-efficient way. Part 1 is devoted to optimization of the fundamental movement forms required for playing the guitar. "A new standard...no guitarist should be without this groundbreaking pair of volumes." Part 2 develops the advanced techniques required for mastery and virtuosity. "With this work, Stanley Yates goes beyond the traditional concept of the guitar method or the guitar technique treatise. The history of the instrument includes outstanding examples, but none that constitutes an adequate precedent to this book from the Anglo-American master..."
Pavana-Capriccio, Op. 12; Suite española, Op. 47 (Granada, Cataluna, Sevilla, Cuba); Recuerdos de viaje, Op. 71 (Rumores de la caleta, En la playa); Doce piezas caracteristicas, Op. 92 (Minuetto a Sylvia, Torre Bermeja); Dos danzas españolas, Op. 164 (Jota aragonesa-Aragón, Tango); España, seis hojos de álbum, Op. 165 (Preludio, Tango, Malagueña, Serenata, Capricho catalán, Zorzico); Serenata español (Cádiz), Op.181; Mallorca Op. 202; Zambra granadina; Càdiz-gaditana; Chants d"Espagne, Op. 232 (Prélude—Asturias-leyenda, Orientale, Bajo la palmera (Sous la palmier), danse espagnole, Cordoba, Seguidillas (Castilla). Czech guitarist-composer Stepan Rak is regarded as one of the most creative and innovative guitarists of the late twentieth century. Eclectic and unique, his music combines depth of expression with technical innovation and brilliant virtuosity. Despite numerous recordings and published editions, however, much of Rak's best music remains unpublished or unavailable. This volume contains five concert works written between 1986-89, each displaying a unique facet of Rak's compositional style: Elegy - Hommage a Sibelius, The Czech Fairy Tales, Aria de Bohemia, Song for David, Sonata Mongoliana. “nothing Western compares with it, nothing has this incredible force and energy. This book brings before everyone the work of a very special musician - an inspired writer with an immense array of brilliant techniques to interest, entertain and astonish. Good to see these excellent works in print at last." CLASSICAL GUITAR, England. Ernest Shand (1868-1924), the leading figure amongst the guitarists of Victorian England, is known today for only a handful of the many pieces published during his lifetime. This edition of 23 pieces, taken from his output of 220 opus numbers, reveals a guitar composer of great originality and charm who had a gift for spinning an infectious melody. While, in form and general character, Shand's style is reminiscent of the piano miniatures of such contemporaries as Grieg or MacDowell, at times of Chopin, his sentimental melodies and colourful harmonies impart a unique Victorian flavor which seems to echo the sing-along anthems and nostalgia of the English music halls. This re-typeset edition is based on the original publications of Shand's music contained in the Bickford Collection housed at the International Guitar Research Archive, California State University, Northridge, CA. All of Shand's original fingerings are reproduced, and are augmented with easily distinguishable editorial fingerings which suggest solutions for passages left unfingered in the originals or that provide alternatives to those original fingerings that may prove problematic for the modern player. The edition also includes commentary relating to Shand's life, his musical style, and his performance technique. This collection of new music, written by composers who are performing guitarists themselves, presents a collection of intermediate to advanced concert works that explores the musical and technical diversity of the contemporary guitar. Each composer offers a unique musical and technical perspective of what the contemporary guitar is -- the harmonic language ranges from jazz to atonality, the stylistic one from blues to minimalism, the cultural one from Eastern European to Celtic. Music by Delpriora, Gilardino, Hudson, Johanson, Kenyon, Marron, Mearns, Ourkouzounov, Piorkowski and Van der Veen. "guitarist-composers composing for guitarists -- a journey around the world with contemporary music...exciting work for long evenings filled with outrageous sounds..." GITARRE AKTUELL, Germany. Easy music by Aguado, Carcassi, Carolan, Carulli, Domeniconi, Giuliani, Hudson, Koshkin, Manjon, Mertz, Morlaye, Nava, Rameau, Rak, Ribayez, Shand, Sor, Tesar, Winner, Yates, York, Zenamon. Easy-Intermediate music by Aguado, Ali, Bach, Calvi, Carcassi, Carolan, Carulli, Cutting, Dowland, Fuhrman, Garcia, Giuliani, Houghton, Hudson, Koshkin, Kuffner, Mertz, Murcia, Nava, Rak, Ribayez, Seth, Shand, Sor, Tesar, Visée, Yates, York and Zenamon. En Mode is a set of 22 easy character pieces for guitar with a light contemporary flavor, "in the style of..." The intention has been to provide early students with pieces that cover a wider range of musical genres than is usually found in traditional "accessible" repertoire. Some of the pieces are grouped into suites appropriate for performance ("Three Japanese Pieces" and "Short Suite in Baroque Style"); other performance groupings are possible. The pieces are presented in progressive order. These twelve "mechanical" studies for guitar are intended as an atmospheric modern counterpart to the classical arpeggio study, a fundamental aspect of right-hand training. Blues and Ballads, written in 1996, is a set of three concert works for solo guitar in jazz-blues style.